DOSKEY Format=Echo I've disabled the Format command. I'm sure the semicolon used to act as a comment/REM character in Doskey but it looks like that stopped working at some point. 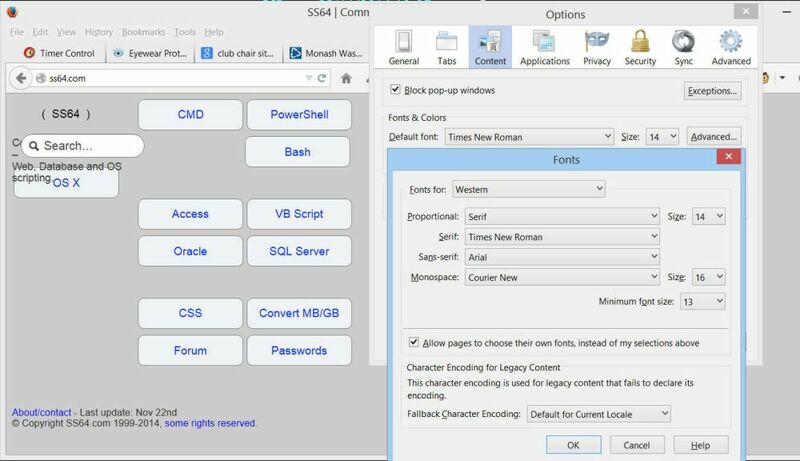 http://ss64.com/nt/netsh.html - may be it will be good nvspbind (http://archive.msdn.microsoft.com/nvspbind) to be added - as it is the only command line tool that I know that can modify network bindings. These are now updated along with the pages for IF comparison operators. The relevant pages now have a brief mention about Hex and Octal numbers along with a link to the DosTips thread. changes in environment variables (I'll try to prepare texts for both) .Also %DPATH% and %KEYS% could be included in dynamic variables - http://ss64.com/nt/syntax-variables.html . As the TASKLIST is not available in Home/Basic/Budget/Whatever-Depending-On-Version editions of Windows (this also could be important to be known if you hit the issue few times) , QPROCESS remains a viable alternative for listing process so links in RELATED sections and mentioning limitations will not harm. The same case with TASKKILL and TSKILL - TSKILL is only available process killer in a fresh installed home-edition of windows (part of terminal services commands - for XP I think they are available after SP2 but I'm not sure). TSSHUTDN - is available only on XP and 2003 (part of terminal services commands) including their 64b versions. NTBACKUP - Windows 8, Windows Server 2008, Windows Server 2012 - server versions only. 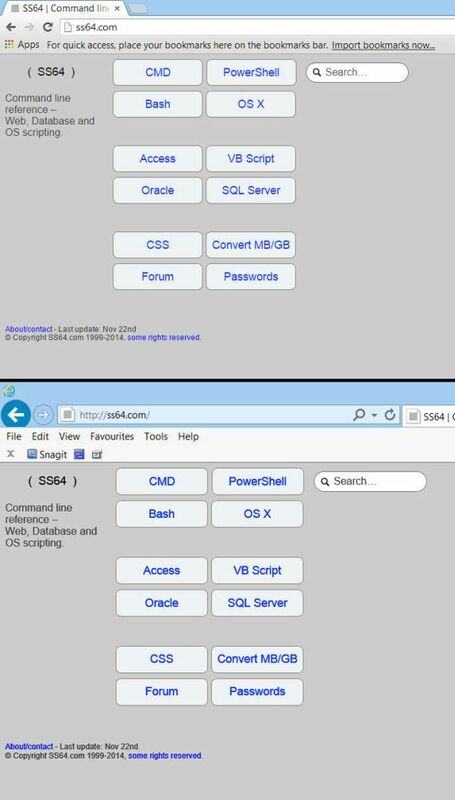 DSACLs - Active Directory /? MAPISEND - Back Office/Exchange Resource kit - where this can be downloaded? I think those are restore-only tools, wbadmin and PowerShell have replaced NTBACKUP. 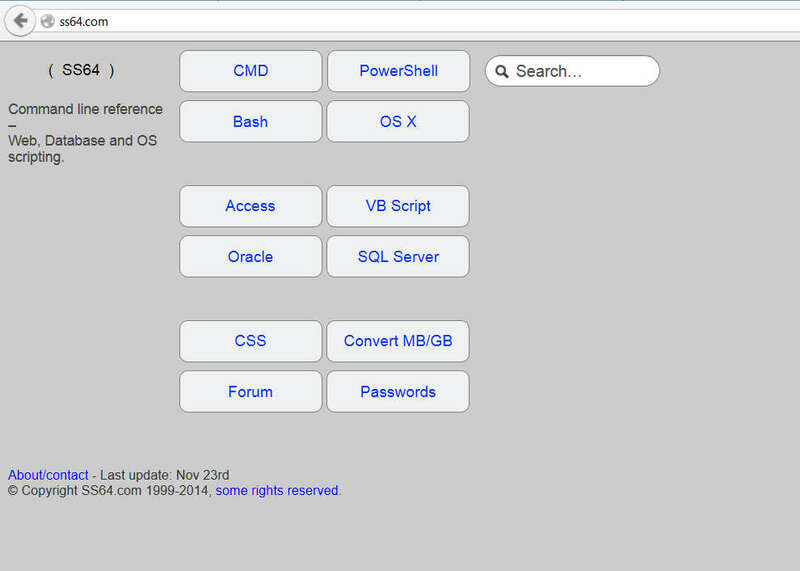 as if they were in the current directory (similar to PATH) in MS-DOS and earlier versions of Windows. The feature no longer works on the windows systems. Type DPATH ; to clear %DPATH% variable. Type DPATH without parameters to display the current path. By default %DPATH% variable is empty. APPEND command (APPEND command is still available in 32 bit versions of windows despite it does not work). This is present for Compatibility with DOS systems. Type KEYS without parameters to display the current state of KEYS. Despite its help message claims that the command has no effects it sets %KEYS% environment variable when it's called with ON/OFF switches to ON/OFF value respectively. Thought KEYS does not rely on %KEYS% variable to preserve its state. processname Process name to be terminated (Usually the name of the executable with trimmed ".exe" suffix). /ID:sessionid End process running under the specified session (default is current)..
processname is limited to 18 symbols. TSKILL is part of terminal services commands . Unlike TASKKILL it does not require administration privileges to run , and is also available in home editions of Windows. - If a command was only provided in an old toolkit that is no longer available, then its removed. - If a command was provided in an old toolkit but there is now a different newer/better option for current OS's, I've updated all the links to the new version and removed the old one. - If a command is still available in an old toolkit and there is no replacement, then I've kept it with a better description of which toolkit it can be found in. - If a command exists in current and old resource kits, then I have only documented the current ones, otherwise you have commands which have been supplied via different toolkits/support packs for NT4 and 2000 and XP and Vista etc, which just gets horribly complicated. So for example if a command is listed as being in the Windows 2003 adminpack and on Windows 2008, it may also be in the old Windows 95/NT4/2000 toolkits but I don't mention those because I think the vast majority of people will only be interested in the most recent version. The Links page now has some lists of all the commands in the different toolkits. I'm starting to think we could do with a spreadsheet cross-referencing all the commands ever released with all the OS's and service packs and toolkits where they have been updated, but thats a job for another day. I can't think of a good enough reason to include these yet. Most of these urls will now redirect to other pages. Thank you too for the hard work. I believe the pages are more informative now. I'll be glad to help here ,if I can . Windows displays the volume label and serial number (if it has one) as part of the directory listing. An NTFS volume label can be up to 32 characters in length, including spaces. NTFS volume labels retain and display the case that was used when the label was created. Delete current volume label (Y/N)? Press Y to delete the label, or press N to keep the label. A volume label can contain as many as 32 characters for NTFS volumes and as many as 11 characters for FAT volumes and can include spaces but no tabs. * ? / \ | . , ; : + = [ ] < > "
This limitation does not apply to NTFS volumes. For FAT volumes, volume labels are stored as uppercase regardless of whether they contain lowercase letters. NTFS volume labels retain and display the case used when the label was created. 2.If %PROMPT% variable is defined or pre-set via registry deleting it will set again prompt to its default value. Special $-sequneces will be taken as a single symbol. GOTO This also can be very misleading so I thing it's worth to be included in GOTO documentation. echo You haven't expected to see  this ,have you? GOTO also breaks & , && and redirection operators. C:\WINDOWS\system32\cmd.exe /S /D /c" if errorlevelb neq b echo %cmdcmdline%"
C:\WINDOWS\system32\cmd.exe /S /D /c" if XLSS lss Y echo %cmdcmdline%"
set "myLine=if 1 lss 2 more"
echo pipe | cmd /c "if A lss B more"
Non-executable files may be invoked through their file association just by typing the name of the file as a command. (e.g. WORD.DOC would launch the application associated with the .DOC file extension). See ASSOC and FTYPE. [drive:]path Specifies a drive and directory to append. /X:OFF       Applies appended directories only to requests to open files. specify a path. /PATH:ON is the default setting. /PATH:OFF    Turns off the effect of /PATH:ON. you use APPEND after starting up your system. Type APPEND ; to clear the appended directory list. As you look the help for dpath says append, but the append command is not present. I have made some changes to the pages for: If, Goto, Call, label, prompt and FC, I am trying not to include too much detail on edge case bugs because I want to keep the pages understandable by complete beginners. I do appreciate all the extra detail but some things are best kept to the forum. I don't know if this is the correct 'place' to post a speed test. This is because for loop waits for type command, once readed all lines by 'Type' is readed by 'For /F', while without 'Type' command (second example) only opens the file and reads directly. Even 'Type' command is more slower than 'For /F' Command! If any filename is invoked from cmd or batch file, if this contains a .exe header, it's opened as exe file. Thanks Honguito98, I've added a couple of notes to the for /f command page and the START page. built in environment variables - not all are listed (not sure if all of them worth to be included) - here are some of the missing - http://technet.microsoft.com/en-us/libr … 90954.aspx - plus ProgramW6432 which is available only on 64 machines and NumaHighestNodeNumber from windows 7 and above (http://en.wikipedia.org/wiki/Non-uniform_memory_access ; http://msdn.microsoft.com/en-us/library … s.85).aspx ). also %=::% which is a pretty mysterious. http://ss64.com/nt/syntax-wildcards.html - COMPACT also works with wildcards. 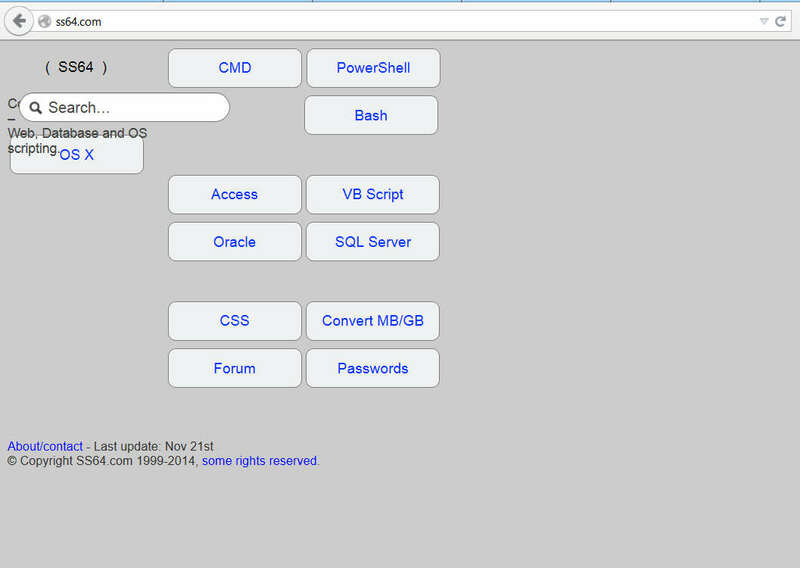 Thanks npocmaka, I've now updated the pages: MODE, CALL, CMD, QPROCESS, Environment Variables and Wildcards. I'm not sure about the size limits for MODE, on Windows 7, I can get a smaller window than 15,1 and it doesn't complain until the size is a bit larger than 229000,743000 although the memory used by conhost.exe does go through the roof with large sizes. Thats one way to burn 1 GB of RAM! I'll have a think about where the stuff on differences between the COM and EXE could go. CHCP, diskcopy and diskcomp although still supported do get very little use, I cant even remember the last time I saw a floppy disc. So having those pages still up and findable through search is a compromise between listing pages that most people won't be interested in and just removing them entirely. This time my trigger to write in this thread is not completely accurate information on FOR /F page (http://ss64.com/nt/for_f.html) so I'm starting with this. 1.tokens=3* will cause the 3rd and all subsequent items on each line to be processed - this will create the third token and will assign all subsequent items to the 4th token (may be this is what you meant ,but is not clear enough) - it has no difference if you using comma before the asterisk or not. - Use double quotes for long file names in "filenameset". When there are no quotes with usebackq option it again works with file name set. 3.Again for tokens (this is where info is not entirely correct) - "It is actually possible to assign up to 61 tokens by using the ASCII codes from this range:"
09  0x09  <tab>         No       %%^<tab>  or  "%%<tab>"
32  0x20  <space>       No       %%^<space>  or  "%%<space>"
34  0x22  "             %%^"     %%"  or  %%^"
38  0x26  &             %%^&     %%^&  or  "%%&"
41  0x29  )             %%^)     %%^)  or  "%%)"
44  0x2C  ,             No       %%^,  or  "%%,"
59  0x3B  ;             No       %%^;  or  "%%;"
60  0x3C  <             %%^<     %%^<  or  "%%<"
61  0x3D  =             No       %%^=  or  "%%="
62  0x3E  >             %%^>     %%^>  or  "%%>"
94  0x5E  ^             %%^^     %%^^  or  "%%^"
124  0x7C  |             %%^|     %%^|  or  "%%|"
logman create alert notepad__ -th "\Processor(_Total)\%% Processor Time>5" -tn "notepad__task"
VIII. TYPE - would suggest to include STRINGS.EXE form sysinternals in the related stuff .This tool proved useful for me. IX.BITSADMIN - as this is something that's confused me - bitsadmin does not work with relative paths. III.Wildcars - updated wildcards page and IF page. I don't think other FOR pages need update as this concerns mainly for /f options. May need to be changed. To calculate tokens sequence FOR /F uses their ascii codes. The characters from 128 to 254 (from the extended ascii characters) can be used as tokens without problems (hence there could be problem for copying/pasting these characters...). 255 cant. Some of them cannot be used as first token and others need some workarounds. The dbenham's table is clear enough I think. -PROCESSOR_ARCHITEW6432 - when 3b process starts under 64b system. -HIGHESTNUMANODENUMBER - avaialble from win7 (not sure about Vista .Has a chance to available for XP sp2) - dynamic variable not visible with SET "
-=::=::\ - nobody knows what this is. I have now reworded the CHCP page, with some more Unicode details, updated the FOR /f page to list the token characters that can be used without extra escaping and linked to dbenham's table for the masochists who want more than 31 tokens. Also added NLTest and updated the environment variables table. I'm also going to add a page for SETSPN when I get the time. I have today re-arranged the SS64 home page, this is mainly to make browsing easier on small/mobile devices - there is more space around the buttons to make things easier on touch devices. Just commenting that Firefox here isn't too happy with it - desktop version, V33.1, Windows 8.1 32bit, have adblock loaded. I have just made the search box a bit narrower, does it work for you now? It looks fine in Chrome and MSIE - Firefox is below and in safe mode - which also is odd. It's V33.11 now. OK I managed to reproduce it with the different font sizes. Try again now - should hopefully be fixed. It's looking fine here now - all good. forfiles /c "ping ping -a"
forfiles /c "find find /c /v 0x220x22 @path"
The tokens of the wrapping loop are accessible event through a subroutine - but only inside the nested FOR. Works even if the inner loop is in separated bat file. 10.IEXPRESS - does this utlity worth a page? It's available in every windows system and besides it's UI it also has a command line interface. Creates a single self-extracting package from a set of files. ExtractOnly=0/1 ;If 1 will execute nothing after extraction.If missing will create only a cab file. RebootMode=0/1/2 or A/I/N/S ;0-will not reboot machine afer installation,1-force restart,2-if restart is needed. InstallPrompt="Do you wish to install this Sample App?" EndMessage="Thank you installing Sample App"
The cmd /c is required for this item. forfiles /c "cmd /c ping -a"